Recently, NFL coach Mike Zimmer was reported to have had 3 surgeries for repair of a retinal tear and retina detachment all occurring over a month’s time. His last “emergency surgery” for a retina detachment caused him to miss his team’s game against the Dallas Cowboys. He has since returned to coach the team, albeit with a noticeable patch on his right eye. From the news, Coach Zimmer may have been diagnosed with a retinal tear after seeking treatment for a scratched cornea. He then underwent the first of three treatments. A second procedure was performed about a week later, culminating with the “emergency retina detachment surgery” splashed across sports headlines which caused him to miss the Minnesota-Dallas game. What can we learn from Coach Zimmer’s experience? The purpose of this article is to simply raise awareness over retinal tears and the seriousness of a retina detachment. A retinal tear can develop into a retinal detachment. Retina specialists, such as Vincent Sardi, M.D, prefer to treat retinal tears with either laser treatment or cryotherapy to prevent the development of a retinal detachment. The usual symptoms of a retinal tear include sudden onset of flashes and floaters. In fact, all patients who develop sudden flashes and floaters should undergo a complete dilated eye exam looking for a retinal tear. Often retinal tears can develop without symptoms, that is, there are no warning signs. It is quite possible that Coach Zimmer had a retinal tear and was completely unaware. Retinal tears are painless. There is also no connection between a scratched cornea and a retinal tear. Pneumatic retinopexy is a method by which some retinal detachments can be fixed in the office. Depending upon the location of the tear which causes the detachment, gas can be injected into the eye to aid in the repair. This usually requires the patient to maintain a specific head position so that the gas remains against the tear on the retina. For instance, if a tear is located at the top of the eye, the patient would have to keep his head erect, or straight up. Two other methods of repairing a retinal detachment include eye operations called a vitrectomy and a scleral buckle. Gas is often used in conjunction with these procedures, too. Again, head positioning is an important part of the recovery process. Prior to his return to coaching the Vikings, several articles did report a concern over airplane travel (to play the Jaguars in Florida) and an alternate plan to drive to Florida. Change in atmospheric pressure can occur with airplane flight and travel up into the mountains. This decrease in atmospheric pressure can allow the gas in the eye to expand too fast causing the eye pressure to rise and cut off blood circulation to the eye. 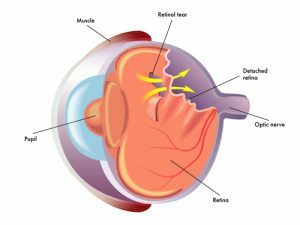 Retina Detachment | Emergency Surgery? Most retina detachment surgery are not emergencies. There are times, however, when the macula (the functional center of the retina which gives you 20/20 vision) is attached, but may become detached by waiting. Often times, the size of a detachment is small and the macula is not “threatened,” but when central vision might be jeopardized, retinal detachment surgery becomes an emergency. This is probably the most important point highlighted by Coach Zimmer’s situation. Retinal tears usually result from a natural event called a PVD (posterior vitreous detachment). A PVD eventually occurs to every eye. When a PVD occurs, a patient is at risk for developing a retinal tear for the next six weeks. This means that following a PVD the risk of retina detachment is high for a six week period. Additional retinal tears or even a retina detachment can follow a single initial retinal tear. Trauma is usually not a cause of retinal tears. Despite all the head banging in football and other contact sports, including boxing, retinal detachments can occur, but not often. Call us to make an appointment or email us!